Anyway, look foward to discussing Clint with you !!! Welcome to the Clint Eastwood Web Board, Savannahlee. I moved your post from the Eastwood News section to this thread that has been specifically set up for new members to introduce themselves. We're glad you have joined us and hope you enjoy dropping by when you can. Hi everyone, I'm Sean & I'm from Scotland. I'm new to these pages but cant wait to get involved. Clint has been my favourite actor since I was around 15 years old, now I'm 33 so I've been a fan for a while. I love his films more now than ever. Too many to pick a favourite but if pushed I'd probably go for 'Josey Wales'. I have a big claim to fame, I actually met Clint & got him to sign my copy of 'Dirty Harry' a few years back when he was visiting Scotland to play golf. What a day that was. Cant wait to search the posts & add my input. Speak soon. Welcome to the board, Sean. Sounds exciting, getting to meet Eastwood and get him to autograph a copy of Dirty Harry! Metting Clint, WOW, your the envy of every member (who hasn't met Clint) on the board. I turned a Clint fan at around 6, when I wayched Dirty Harry with my Dad, I'm 14 now, so I've been a fan for 8 years. Looking foward to disscussing Clint with you. My name is Jason and I live in the UK.Ive been a huge fan of Clint's for well over twenty years.I think it was probably A Fistful Of Dollars that first made me aware of him.Im sure those Westerns mean a lot to all members of the board! Welcome to the Eastwood Web Board, Jason! Ive been reading all the diffrent threads and I must say I loved the thread about you guys getting to meet Tuco at the special screening of The Good the Bad and the Ugly.Eli sounds like a fantastic guy! I would like to ask if you were able to take pictures at this event and if you were,if anyone has any I would love to attend events such as these. I am a new Clint Eastwood fan and I'm so glad I found this community. I had never watched any of Clints westerns until my fiance told me that I had to watch at least one. I grumbled and thought okay fine, just to appease him we rented 'The Good, The Bad, and the Ugly'. Well needless to say I was hooked! I've since watched 'A Fist Full of Dollars', 'For a Few Dollars More', 'Hang Em High' and 'Pale Rider'. I have a few others on my list that I'm looking forward to! 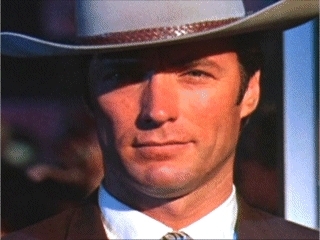 I had always enjoyed Clint in his more recent films like 'Unforgiven', 'Absolute Power', etc. but I feel like I'm seeing him in a whole new light! As a person I always admired his classiness and pleasant personality. I'm so glad to have finally been 'turned on' to his earlier work. I think Clint is a superb actor and quite frankly, his westerns make me feel like he's just the ultimate badass! Welcome to the Eastwood Web board, zach 54 and hot_tamale. Hope you both visit often. Jason, I'm sorry we couldn't get any pictures. I don't think they'd have been allowed anyway, but at any rate, I didn't have a camera with me. But, Eli looked hale and spry. Thanks for the reply KC.I was glad to hear that Eli was on fine form that night. He still looked super on the DVD for Good,the Bad and the Ugly.I really could of listened to him talk for hours more! Im sure just seeing him on that brought back some super cool memories of that for you. My mule don't like you painting the town red. Im a newbie here. It's great to see other Eastwood fans around the world. You should just consider yourself dead cause thats the only way your making it out of here alive. Greetings! I'm Howie and relatively new to this site. I love it. I've been a Clint fan since the days of Rawhide (they weren't reruns when I first saw them) and I still watch them on the Hallmark Channel on Saturdays when not I'm working on my honey-do's list. As for the movies, I used to watch them at the drive in theatre where I grew up. I would have to go at least twice because I did'nt see all the movie the first time, Ahem, If you know what I mean. If I need to explain, let me know. The drive in is still in operation only now I see all the movie the first time! Anyway, love the site and look forward to man years of enjoyment. Welcome, tmw3nyc, Ranger_ and Howie! As for the movies, I used to watch them at the drive in theatre where I grew up. I would have to go at least twice because I did'nt see all the movie the first time, Ahem, If you know what I mean. i am a big Rawhide fan and that is main interest in coming to this board. but i also enjoyed Firefox because of its interesting (although at times tedious) depiction of the Soviet Union during the cold war. my girlfriend is Russian so this now holds a special fascination for me now and i can appreciate it more. i also enjoyed In The Line of Fire and thought it was an extremely well made thriller. i never really liked Clint's spaghetti westerns or got into his Dirty Harry films either. but that is what is good about Clint's career. there is pretty much something for everyone. thanks to those who administer this website! it looks very nice and is one of the best i have seen. Glad you enjoy the Board, Pete! Welcome! Howdy all. It's about time I got around to saying hello to everyone. I've been busy checking out the topics posted here and creating my own. This concept is great; sharing ideas & thoughts with other CE fans around the world. I turned into a die-hard fan the winter before Firefox came out; I'd seen a few of Clint's movies on the big screen with a friend before then; 'Every Which Way But Loose', 'Escape From Alcatraz' & 'Any Which Way You Can' (missed 'Bronco Billy' due to limited release). I enjoyed those movies but after a good dose of Dirty Harry & 'spaghetti westerns' on tv, I became hooked. I'm always looking forward to hearing about Clint's next project. Now I also look forward to hearing from and exchanging thoughts, ideas & laughs with you! ... and continue for a couple of pages. They are locked now, but if you see anything you'd like to comment on, feel free to quote the topic and post your reply in the Westerns forum.